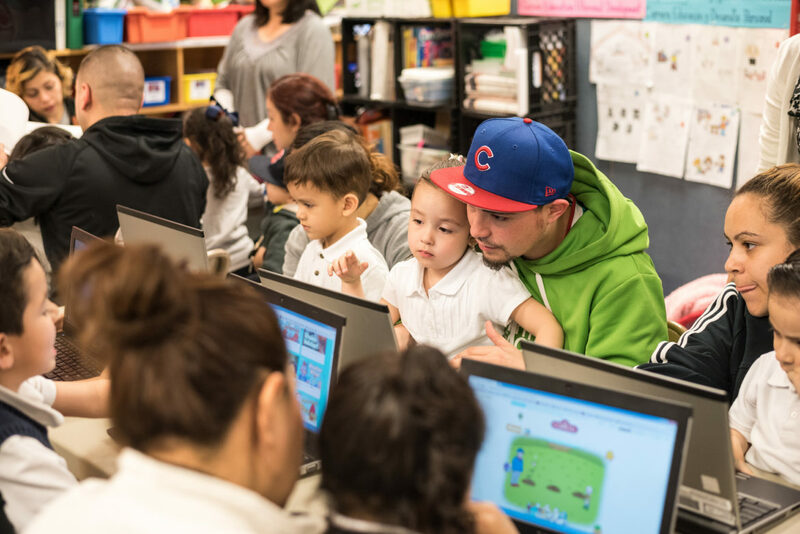 Parents work with their children on science games during a computer class that's part of Peck Elementary School's child-parent center. The preschool program was financed through a "social impact bond," a type of loan in which private investors are repaid based on students’ academic outcomes. Private investors who are paying $16.6 million for a four-year preschool expansion are now assured a $500,000 “success payment” for the initial outcomes—a first step toward a total payout that could eventually more than double their investment. These first results from Chicago’s experiment in what are called “social impact bonds” showed that more than half the children from the first group of 374 preschoolers were deemed kindergarten-ready, triggering the big early dividend for Goldman Sachs and other investors. Social impact bonds are a growing trend in public finance that are being used to pay for projects that target a range of societal problems—in this case, the lack of high-quality preschool for lower-income children. The bonds have the blessing of the U.S. Department of Education, even though, at best, they’ve had mixed outcomes in the cities where they’ve been tried out. Still, the new federal education law, called the Every Student Succeeds Act, will allow school districts and states to use some federal dollars to pay for social impact bond projects. But the expansion of a well-researched, decades-old preschool model called child-parent centers was an investment that critics say is without much risk. Indeed, the longitudinal research on child-parent centers, which require significant parent involvement and provide additional social services to families, has shown academic and social benefits that translate into long-term cost savings of $7 for every $1 spent by taxpayers. And most of the payback to investors is tied to a proposition that some experts view as problematic: an expected reduction in the number of children placed in special education. Next spring, project leaders will release data on investor payments based on that metric, which city officials and investors agreed to because of research showing that children who attended child-parent centers had a 41 percent lower rate of placement in special education. Under the terms of the contract, Chicago Public Schools will pay investors $9,100 for each child who does not need special education, in comparison to children from a control group. The payments are calculated for a student’s entire schooling—that is, for each year until high school graduation. City officials say that the $9,100 per student per year—plus inflation—represents the cost savings from not providing special education services. Without reduced placements, investors lose out. That scenario has some experts worried. Bev Johns, president of the Learning Disabilities Association of Illinois, is concerned about offering such an incentive, especially since cash-strapped CPS is already slashing spending across the board. City officials insist that no child will be denied services. In fact, students with severe disabilities — including autism, deafness and traumatic brain injuries—are excluded from the investor incentive. At the child-parent center that’s part of Peck Elementary in the West Elsdon neighborhood on the Far Southwest Side, teachers and administrators say they continue to identify children with special needs and refer them for services—and nobody has told them to do otherwise. Still, disability rights advocates like Johns, as well as education finance experts from across the country, are closely watching the Chicago experiment and are eager to compare its outcomes with a preschool expansion in Utah that was also paid for with a social impact bond. Officials from Salt Lake City and the nonprofit United Way made a stunning and controversial claim about that program six months ago: 99 percent of “at-risk” children in the Utah program avoided special education, triggering a $260,000 payout to investors. The New York Times soon questioned the claims, citing experts who said not even the best-funded preschools have had anywhere near that level of success. “We believe in the potential of Pay for Success [another term used for social impact bond programs] approaches, and we will help the Pay for Success model mature and continue exploring how it can help governments access often sorely missing capital to provide preschool to more children without putting taxpayer dollars on the line until the results are proven,” they wrote in the January op-ed in the Salt Lake Tribune. As Utah’s experiment shows, there’s no consensus among experts about whether social impact bonds are a good idea. The nation’s first experiment, which launched in 2012 with the goal of reducing juvenile recidivism on New York City’s Rikers Island, was discontinued last summer when evaluators determined it wasn’t meeting its goals and investors lost money. Still, more and more cities and states are turning to the strategy to finance social projects, from housing for the homeless in Denver, to a home visiting program for pregnant mothers in South Carolina to a program that aims to reduce the need for foster care in Connecticut. Ten projects are currently up and running in the U.S., with at least a dozen more in the works. Liebman directs the Kennedy School’s Government Performance Lab, which provides pro bono technical assistance to more than a dozen cities and states that are currently developing or have already launched social impact bonds. These include Chicago and the state of Illinois, which is embarking on its own program to pay for an intervention program for wards of the state involved in the juvenile justice system. State officials told Catalyst last week that the contract for that program—which would outline how payouts to investors are determined—has not been finalized. When Mayor Rahm Emanuel first announced the project in October 2014, in the midst of a re-election campaign, he and other supporters pitched it as an innovative way to increase access to high-quality preschool for low-income 4-year-olds. Unlike the Salt Lake City case, Chicago’s program is backed by decades of research and relies on a control group (children with similar socioeconomic backgrounds who did not attend preschool) to calculate investor returns for reduced special education placement. Altogether, investors — the Goldman Sachs Social Impact Fund, Northern Trust and the Pritzker Family Foundation — could more than double their $16.6 million investment over the life of the program. According to a Catalyst review of the loan documents, CPS is on the hook for as much as $30 million over the life of the program in payments for “savings” from reduced special education placements. City Hall, meanwhile, will kick in up to $4.4 million in additional payments based on kindergarten readiness and third-grade literacy test scores. Spread across four years, the 2,620 half-day slots at child-parent centers represent just a tiny fraction of about 25,000 seats now used by low-income 4-year-olds in publicly funded preschools. But they get the city closer to the mayor’s goal of universal preschool for all low-income children. Not everybody got on board with the mayor’s plan. Then-school board member Henry Bienen, a former president of Northwestern University, voted against the proposal, questioning the metrics and high interest rate. And five City Council members voted against the plan after union officials compared the complicated loan structure to Chicago’s botched parking meter privatization under former Mayor Richard M. Daley. Critics of social impact bonds ask why city officials didn’t simply fund the program outright instead of relying on a complicated loan structure. Jankov points out that the school district and City Hall must pay into an escrow account each year for future projected payments to the lenders. This means they can’t spend all of the “savings” from special education costs on other services in the meantime. In addition, about $1.3 million of bond money will never reach the classroom—it goes instead to a third-party intermediary, auditors and even the investors’ attorneys. Sam Aigner-Treworgy, director of early education policy for the Mayor’s Office, rejects the argument that investing in child-parent centers poses little risk to lenders. She says there is no certainty that students will have the same outcomes as those from past research, much of which was based on the outcomes of mostly black children who attended preschool in the 1980s. More children in today’s child-parent centers are Hispanic, a reflection of demographic shifts in Chicago. “It’s a different contextual landscape,” she says. For now, Aigner-Treworgy says, the Mayor’s Office has no plans to further expand child-parent centers, which were already undergoing a sort of revival with a federal grant. But she says city leaders are considering it. Cerda from IFF says his organization has been in conversations with officials outside of Illinois who are interested in developing their own social impact bond projects, although he declined to name any specific cities or states.